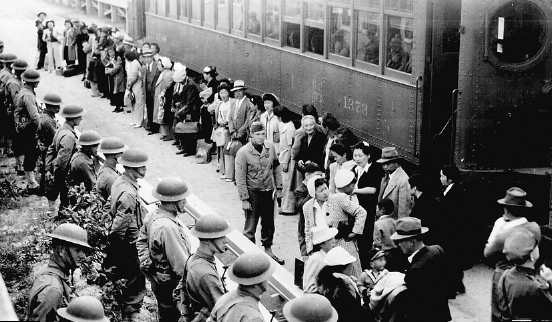 Japanese Americans from San Pedro arrive at Santa Anita Assembly Center by special restricted train on April 5, 1942. “Only What We Could Carry,” an exhibit remembering the Santa Anita Assembly Center 75 years later, will open Saturday, Jan. 21, at the Gilb Museum of Arcadia Heritage, 380 W. Huntington Dr. in Arcadia, and run through April 1. In 1942, thousands of Americans of Japanese ancestry were forced into camps, in many cases for the duration of World War II. Locally, the site that is now the Santa Anita Racetrack was used as a temporary assembly center before these individuals and families were evacuated to more permanent camps away from the West Coast, such as Manzanar. This exhibit will present images and stories from and about those who were incarcerated during this difficult time in American and California history. Sketches by Riyo Sato, who experienced life in camp, will be exhibited. “A Day of Memory” will take place on Saturday, March 25, from 10 a.m. to 12 p.m. Guest speakers will be June Aochi Berk, Bill Shishima and Minoru Tonai. Koto music will be provided by Saeko Kujiraoka. Museum hours: Tuesday through Saturday from 10 a.m. to 12 p.m. and 1 to 4 p.m. For more information, call (626) 574-5440 or visit www.arcadiaca.gov/government/city-departments/museum.